Forums are one of the mainstays of the web. Although people spend most of their time on ‘regular’ websites, forums are some of the most engaging types of platforms you can create. In fact, a lot of modern social media websites are basically forums with additional features on top. The problem is, creating a WordPress forum can involve a fair bit of work, since the platform itself wasn’t developed with this in mind. Setting up and configuring the Asgaros Forum plugin. Craft your WordPress forum structure. For your forum to work, we’ll need to add an entirely new set of features to WordPress. That’s potentially a lot of work, so let’s get to it! Regardless of your hobbies, chances are there are plenty of online forums set up explicitly to discuss them. Simply put, forums are websites where you can submit new topics or ‘threads’ and have people reply to them. They’re the perfect place to have in-depth discussions about almost any topic you can imagine. For example, there are entire forums dedicated to web hosting, for example, cooking, and even niche hobbies, such as knitting. You’ll often find most of the content comes from the user discussions. Compare that to the Hostinger tech blog, for example. While each article has a comments section, the main attraction is the content. If you’re a forum user, you’ve probably noticed that a lot of features cross-over with social media. Take Facebook, for example. 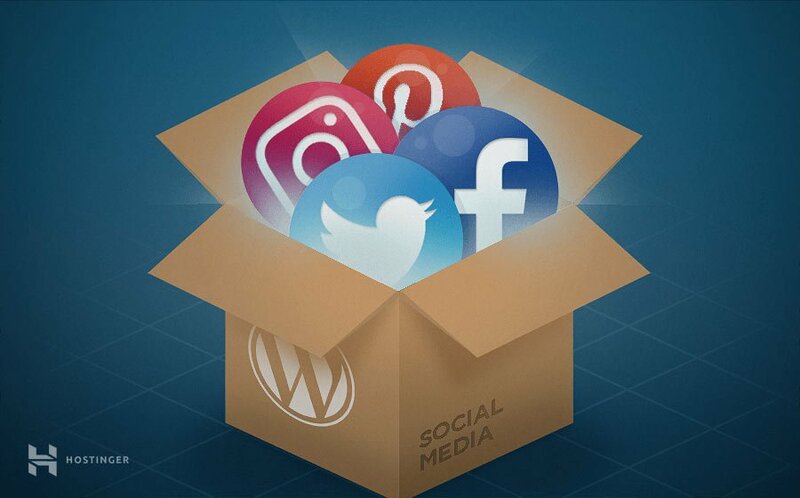 Aside from uploading pictures and keeping up with friends, one of the main selling points is the ability to share content and discuss it with others, much like a forum. In fact, if you take a look at the five most popular websites on the web, you’ll notice two of them offer forum (or forum-like) functionality. We’ve already mentioned Facebook, but Reddit is also basically a forum with a lot of extra features. Overall, running a forum offers a different set of challenges than a website, although it also has its benefits. For example, with a forum, you don’t have as much pressure to post original content. They’re also better when it comes to fostering discussion and engagement, which keeps a lot of users coming back. However, forums aren’t a viable option for most web projects. For example, if you want to set up a portfolio, you obviously will have next to no use for forums and would be better served by building a standard website. However, if you’re running a website with a strong social component, or you offer services online, setting up a forum can be a good idea. You can even run one alongside your regular website and use it to foster discussion about your content and services. Setting up an online forum usually requires you to use specialized software. With WordPress, you can add forum functionality to your website using plugins, and there are plenty of options. In the next section, we’ll discuss a couple of popular plugins, then introduce you to one of our favorites! Firstly, let’s check out some of the more popular solutions available when it comes to WordPress forum plugins. These are often the ‘go-to’ choices for many WordPress users, so it’s worth discussing them before getting onto one of our favorites. When it comes to WordPress forum plugins, bbPress is arguably the most popular option around. In fact, it’s the software that powers WordPress.org’s own support forums, so it comes with a stellar pedigree. As such, bbPress is highly customizable. You can extend its functionality further with other plugins, and even set up dedicated themes for your WordPress forum. Overall, it’s a great option if you’re looking for a forum plugin with a lot of advanced functionality, although when it comes to style, it does look a bit outdated. Next, wpForo offers an experience that’s somewhere in between bbPress and the next plugin (Asgaros Forums) in terms of features. It’s a bit more complex to set up than the latter and it packs a lot of advanced functionality. The plugin even offers its own set of add-ons, although not as many as bbPress does. When it comes to style, wpForo scores high marks. It looks just as sleek as Asgaros Forum, although there’s more going on visually. If you want to use a forum plugin that offers advanced features and manages to look stylish in the process, this one is a great pick. Let’s now take a look at the solution we’ll feature throughout the rest of this article. Asgaros Forum is one of many WordPress forum plugins available for free. However, it stands out thanks to its ease of use. In practice, it should only take you a few minutes to set up the plugin and have a fully working WordPress forum ready. If you want more control over your forum experience, the plugin also offers a lot of settings you can finetune. Once the plugin is active, you’ll be able to set up a dedicated WordPress forum page on your site. You can then use much like any other online forum and create threads, comment on existing ones, set up subforums, and more. You can also add individual forum sections to practically any page using shortcodes, which can be useful if you don’t want to set up an entire discussion board. Moreover, the plugin also includes basic moderator functionality. This means you can remove content if needed, and even ban users for repeated infractions. Should your WordPress forum grow, you can also designate other users as moderators so they can help you keep things in check. Finally, Asgaros Forum enables you to customize your forum’s style using themes, and it supports multiple languages out of the box. Lets you set up a fully-working WordPress forum in minutes. Enables users to comment as guests. 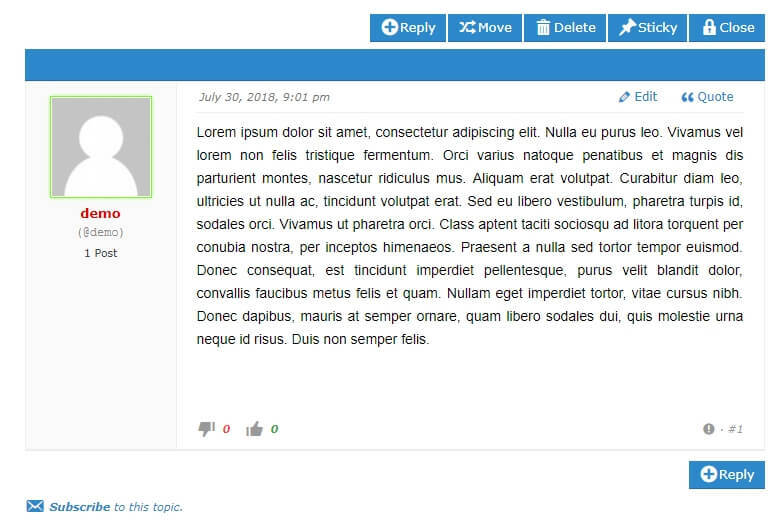 Lets you moderate your WordPress forum’s content and designate other users to help you. Offers reports on specific posts and ban users if needed. Although it’s simple to use and to set up, Asgaros Forum is by no means lacking when it comes to functionality. It offers practically all of the features you’d expect from any modern forum in 2018. Unless you’re looking for some highly-specific feature, you can’t go wrong with Asgaros Foruma. For this section, we’re going to show you how to set up a WordPress forum using the Asgaros Forum plugin. Although the other plugins we’ve featured will have similar steps, they (obviously) could differ. This means you may need to consult the documentation for specific guidance. Click on the Install Now button next to the plugin’s name, then click the blue Activate button. 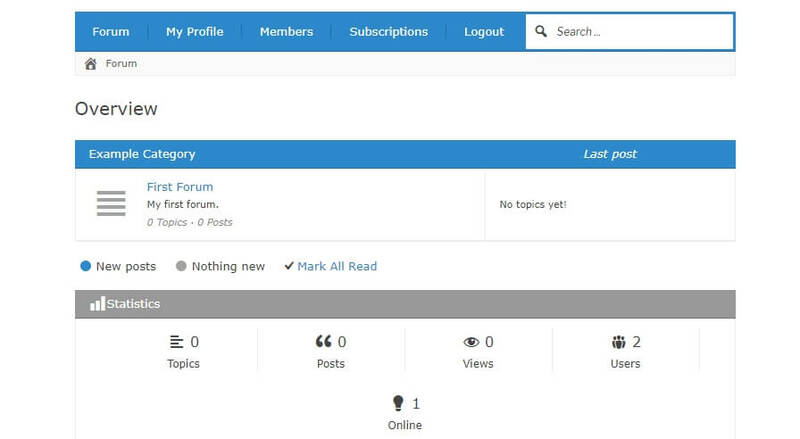 At this point, a new Forum tab will show up on your WordPress dashboard. Generally speaking, the defaults are fine to stick with. However, you can safely increase the number of replies per page, if you wish. Next, the Asgaros Forum plugin uses its own built-in editor for new topics and comments, which is enabled by default. We’ll show you how this works in a minute, so we recommend keeping this setting turned on. If you like to keep a clean inbox, we recommend setting up an email just to deal with forum-related issues. Otherwise, the more users you have, the more difficult it could be to locate forum notifications in your inbox. That’s about it for your new WordPress forum settings. Go ahead and save your changes, then move on to step number two! Now let’s edit the forum already set up for us, so we can actually use it. To do that, click on the Edit Forum button to the right of its name. Go ahead and change its name and set a description for it. While you’re here, you can also assign it a new number under the Order field. When your forum structure is ready, you can move on to the final step, where we’ll test if everything is working correctly. The first thing you’ll want to do is create a new topic to check if everything is working correctly. To do this, click on the New Topic button on the right-hand side of a specific forum. Since this is a test topic, you can type anything you want. While we’re at it, hit the Subscribe to this topic option so you can test if the plugin’s emails reach you correctly. Notice there are multiple options for how to interact with your topic. As an administrator, you can sticky, delete, and close threads, which is something regular users can’t do. 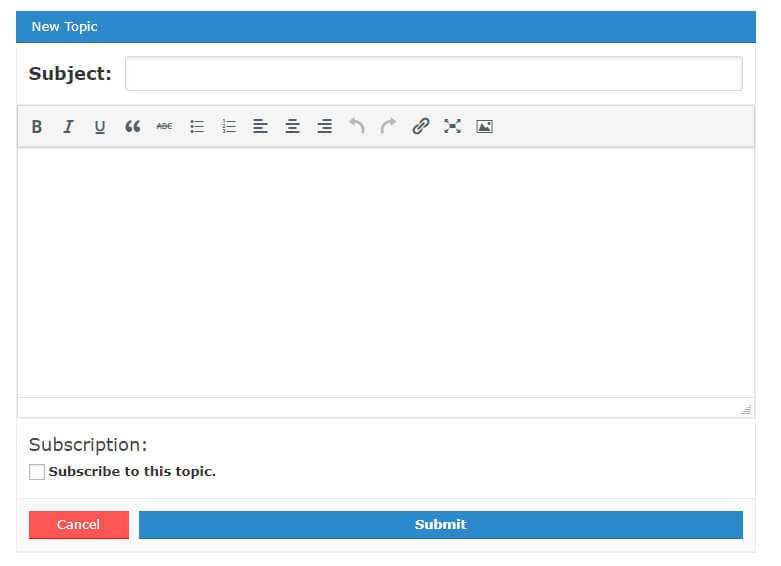 You can also reply to any topic on your WordPress forum by clicking on the button to the bottom right, which will again launch the editor. If you can both publish new topics and posts, you know the forum is working correctly. All that’s left now is to tell your users about it so they can sign up! When people think about WordPress, forums aren’t usually the first thing that comes to mind. However, with the right plugin, anyone can set up a WordPress forum. You have a lot of options to choose from, but if you’re looking for something straightforward, Asgaros Forum should be right up your alley. 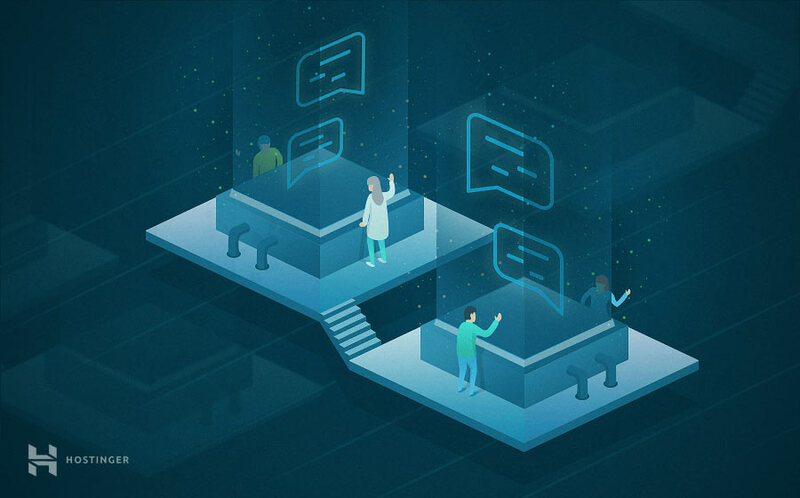 With this plugin, you can set up a working forum in a matter of minutes, including all of the features you’d expect. And if WordPress is not your cup of tea, there are loads of other options you can pick. For more information, check out our article on the best forum software solutions for online community building. Do you have any questions about how to set up a WordPress forum? Let’s talk about them in the comments section below! Never know wordpress can integrated with forum features till I read this post. All the while I am using free forum script the phpbb for my forum. I always face the problem to have a blog and forum that having the same theme and outlook. Now with this, it just solve my problem. Thanks for sharing such useful wordpress forum features to me. It’s really help. Forums are one of the mainstays of the net. Despite the fact that humans spend most in their time on ‘everyday’ websites, boards are some of the most engaging styles of systems you could create. In truth, loads of contemporary social media websites are basically boards with extra features on top. The hassle is, growing a wordpress forum can contain a truthful little bit of work, for the reason that platform itself wasn’t advanced with this in mind.